EAST London’s Sandiswa Qayi, who heads a start-up business called Amahlathi Eco-Tech (AET), has won an award for an innovative energy saving device that can be fitted to a geyser. 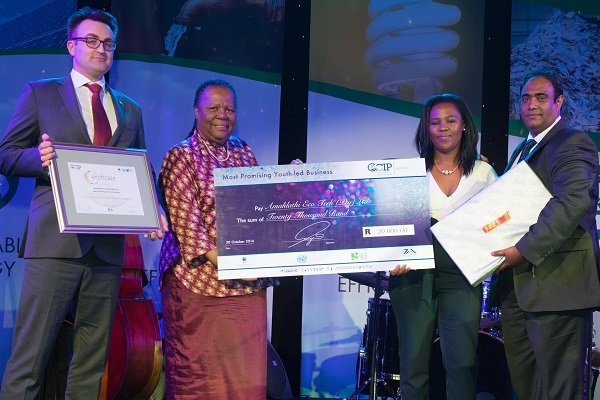 Qayi walked away with the Most Youth-led Business Award in this year’s Global Cleantech Innovation Programme (GCIP) for small and medium enterprises (SMEs) in South Africa. The GCIP is one of the South Africa’s biggest programmes, which offers a unique competition-based approach to identify innovative SMEs across the country. Each year Cleantech runs a five month programme with participants invited to attend workshops, presentations and training clinics. The programme received more than 200 entries this year and they were eventually cut down to nine finalists. After attending workshops, participants then had to present innovative ideas that provided clean technology solutions focusing on energy-efficiency, green buildings, renewable energy, waste beneficiation and water efficiency. AET presented a device called the Hot Spot. It functions like a sleeve and can be retrofitted over any standard geyser element to push hot water from the bottom to the top of the geyser using a thermosiphon, a method of passive heat exchange based on natural convection. This makes it quicker to get hot water while consuming less electricity. The device can provide 50 litres of hot water in 30 minutes at 50°C. The awards were announced by Minister of Science and Technology Naledi Pandor at a glitzy ceremony in Pretoria last week. Pandor commended the programme for showcasing the country as an innovative nation and for creating platforms that linked entrepreneurs with investors, business and commercial partners. She said this had the potential to commercialise new products and services and ultimately create new jobs. “Innovation adds momentum to the structural economic change that is needed for economic growth, job creation and an improved quality of life for us all,” said the minister. Qayi, who has had executive and project management experience in the manufacturing and economic development field for over five years, said the GCIP had taught her the value of understanding the development of a business model through validation. She said this had enabled AET to develop a sound and bankable business plan. “This award puts the company on the map. This not only enables us to compete at national level but to also compete globally,” she said. AET is currently working on commercialising the device and plans to install them in more than 40 households around BCM next year.